When it comes to understanding the needs of local communities, Community Foundations hold a wealth of knowledge. Through the experiences of staff and trustees as well as constant engagement with local community groups and charities, they already have a well-rounded picture of the local area. However, this doesn’t mean that all bases are covered. Community Foundations cover vast geographic areas and fund a wide range of projects. Even with all the internal knowledge within organisations, there are still challenges around finding up-to-date data that can back up the claims. Particularly, when it comes to finding data for specific areas or neighbourhoods, as well as finding the time and capacity to really dig into the data. Several Community Foundations are using Local Insight to help tackle these challenges, so that they are able to demonstrate to applicants and donors what the local community needs are, strengthen an already deep local knowledge and add value to the Community Foundation offer. Local Insight provides instant access to more than 900 local level datasets and all of the data is matched to the areas you care about, whether that is a ward, a selection of local authorities, a parish or an arbitrary boundary. One example of this is a needs analysis report OCF have put together on educational inequality in Oxfordshire. Using the data available in Local Insight, they were able to publish a report showing the types of educational inequality and its consequences, as well as pinpoint specific areas in the county that needed support. Within Local Insight you can set up bespoke geographies quickly and easily by selecting from a list of standard areas or drawing a boundary on a map – to name a couple. In addition, all of the data that the system holds becomes immediately available for those specific areas. Because of this, it has become an obvious tool for some Community Foundations to use when planning and setting up new funds. It enables organisations to test assumptions, identify the most appropriate areas and make a compelling case to donors. “When establishing a place-based fund, we used Local Insight to determine the level of need in the area, which also helped us scope particular donors. Donors that we approached were impressed with the level of information we could provide them that was particular to their interests.” – Durham Community Foundation. 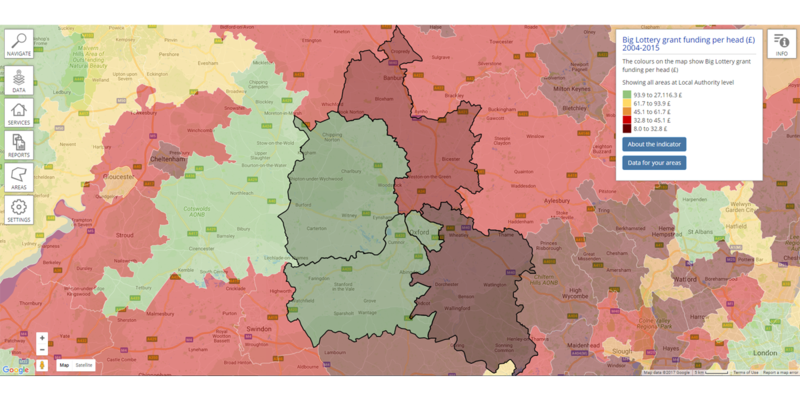 “We have used Local Insight to map deprivation and health indices on a map for a proposal document to demonstrate the case to set up a new Geographical fund for Cheshire West and Chester Local Authority area.” – Cheshire Community Foundation. Demonstrate credibility to donors: Through showing potential donors quickly and easily what the local needs are on their doorstep and backing up the assertion that Community Foundations are best placed to manage local giving for local needs. Support local community groups and charities: Through sharing copies of reports about their local areas in order to strengthen their applications, and hopefully increase their chances of securing funding elsewhere too. Assess applications: Through being able to quickly and easily fact check claims of local need in grant applications. Create visual aids for presentations: Through being able to plot the locations of where grants have been awarded as well as produce charts and maps depicting local needs. If you would like to find out more about Local Insight and explore some of the data for your own areas, register for a demo and free trial. If you would like to speak to one of the team, give us a call on 01273 810270 or email kimberley.anscombe@ocsi.co.uk – we are always happy to chat.